This on-line merchandise store is located in the UK where we have a selection of ride patches and other products available to purchase. We continuously change our product range so it's worth checking back from time to time! Payments can be made by PayPal or any major credit card (use the pay by PayPal option for credit card payments!). Note that this is a UK store and all net profits will go to the Royal British Legion Poppy Appeal. There may be merchandise available from your local ride organisers to help support their chosen charity, so please check with them too! As always, please let us know via the 'contact us' links throughout the website if you are experiencing any problems with this eStore. The AMRR Main Patch is based on the original 'American War Cemetery' (AWC) design used for the .. 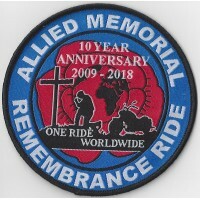 This is the Allied Memorial Remembrance Ride 10 Year Anniversary patch (2009-2018). Keeping with the.. 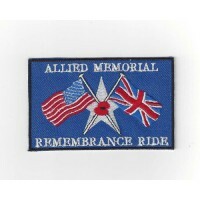 This is the Allied Memorial Remembrance Ride logo patch incorporating the poppy with the globe at it..